United States President Donald Trump on Sunday assured 'great ally' Japan of America's full support after North Korea, in an apparent provocation, test fired a ballistic missile, which was denounced by the visiting Japanese Prime Minister Shinzo Abe as ‘absolutely intolerable’. 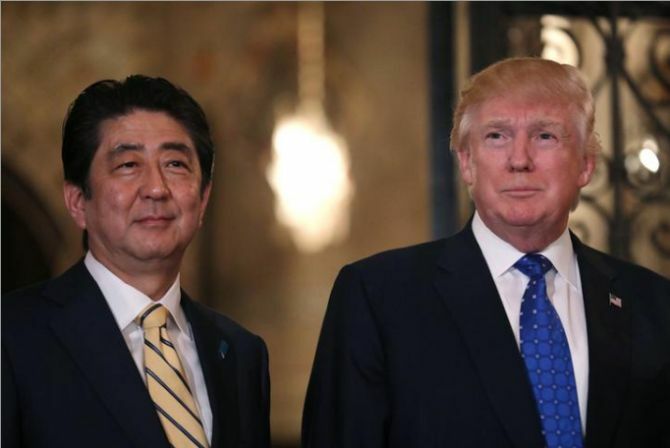 “I just want everybody to understand and fully know that the United States of America stands behind Japan, its great ally, 100 per cent,” Trump said in a brief statement during a joint news conference with Abe. He did not elaborate. His comments came after Abe denounced the North’s missile launch -- the first after Trump became the US President -- at a hastily organised joint briefing at Mar-a-Lago in Florida. The news conference lasted for less than three minutes. “North Korea’s most recent missile launch is absolutely intolerable,” Abe told reporters. "North Korea must fully comply with the relevant UN Security Council resolutions." The two leaders were talking to reporters after spending the day at a golf course and discussing US-Asia engagement. “During the summit meeting that I had with President Trump, he assured me that the US will always [be with] Japan 100 per cent, and to demonstrate his determination as well as commitment, he is here with me at this joint press conference,” Abe, who spoke via a translator, said. In a statement, the US Strategic Command said it detected a North Korean launch of a medium- or intermediate-range ballistic missile. It occurred near the north-western city of Kusong and the missile was tracked over North Korea and into the Sea of Japan. The North American Aerospace Defence Command determined the missile launch from the North did not pose a threat to North America, the statement said. Earlier, the South Korean defence ministry had said that North Korea fired a ballistic missile to ‘provoke’ the new United States President. The missile was launched at around 7.55 am (local time) from Banghyon air base in the western province of North Pyongan. It flew 500 kilometres towards the Sea of Japan (East Sea) before falling into it, a defence ministry spokesman said. ‘It is believed that today’s (Sunday’s) missile launch ... is aimed at drawing global attention to the North by boasting its nuclear and missile capabilities,’ the ministry said in a statement. It is also believed that it was an armed provocation to test the response from the new US administration under President Trump, it added.